MUMBAI: The tiny, white homoeopathic pills could be as effective as allopathic painkillers, says a new research from the city's premier research institute. The research was done in the Institute of Chemical Technology, formerly called the University Department of Chemical Technology, in Matunga, along with homoeopathic specialist Dr Rajesh Shah. 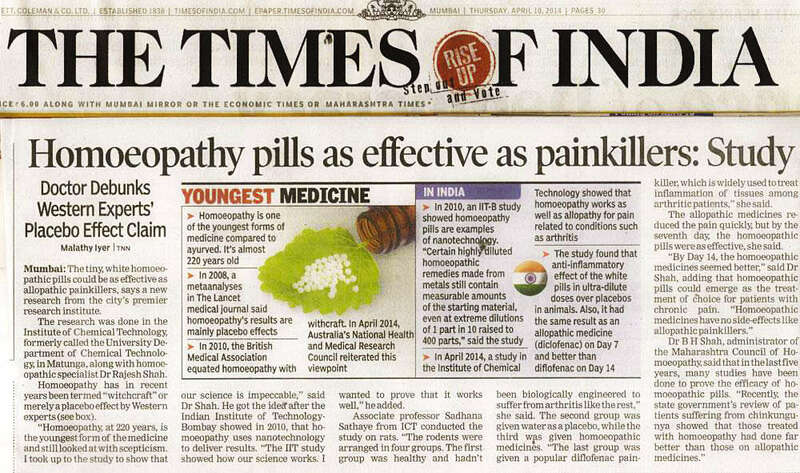 Homoeopathy has in recent years been termed "witchcraft" or merely a placebo effect by Western experts. "Homoeopathy, at 220 years, is the youngest form of the medicine and still looked at with scepticism. I took up to the study to show that our science is impeccable," said Dr Shah. He got the idea after the Indian Institute of Technology-Bombay showed in 2010, that homoeopathy uses nanotechnology to deliver results. "The IIT study showed how our science works. I wanted to prove that it works well," he added. Associate professor Sadhana Sathaye from ICT conducted the study on rats. "The rodents were arranged in four groups. The first group was healthy and hadn't been biologically engineered to suffer from arthritis like the rest," she said. The second group was given water as a placebo, while the third was given homoeopathic medicines. "The last group was given a popular diflofenac painkiller, which is widely used to treat inflammation of tissues among arthritic patients," she said. The allopathic medicines reduced the pain quickly, but by the seventh day, the homoeopathic pills were as effective, she said. "By Day 14, the homoeopathic medicines seemed better," said Dr Shah, adding that homoeopathic pills could emerge as the treatment of choice for patients with chronic pain. 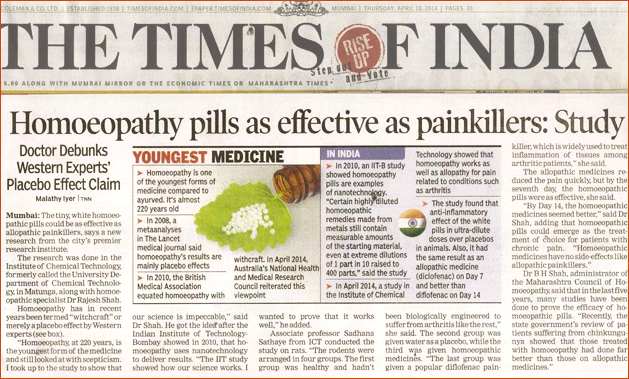 "Homoeopathic medicines have no side-effects like allopathic painkillers." Dr B H Shah, administrator of the Maharashtra Council of Homoeopathy, said that in the last five years, many studies have been done to prove the efficacy of homoeopathic pills. "Recently, the state government's review of patients suffering from chinkungunya showed that those treated with homoeopathy had done far better than those on allopathic medicines." Homoeopathy is one of the youngest forms of medicine compared to ayurved. It's almost 220 years old. In 2010, the British Medical Association equated homoeopathy with witchcraft. In April 2014, Australia'a National Health and Medical Research Council reiterated this viewpoint.